The family of a man who was killed by a paranoid schizophrenic is taking a petition to Downing Street calling for more cash for mental health care. Denis Finnegan, 50, from Thorne, South Yorkshire, was stabbed to death in a south-west London park last year. 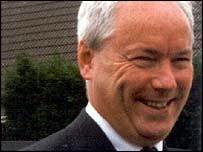 His killer, John Barrett, had been given leave from a hospital the day before the killing in September 2004. A 5,000-signature petition calling for more government money is to be handed in on Wednesday. John Finnegan, the victim's brother, said: "The hospitals are run by doctors - not business people - and I think they need some help to spend the money in the right places. "Then, eventually things will turn around a bit." Despite a long history of mental illness and violence, Barrett had been given "ground leave" from Springfield Hospital in Tooting, south London the day before he killed Mr Finnegan. He was jailed for life in March after pleading guilty to manslaughter on grounds of diminished responsibility. An independent inquiry is under way into the circumstances surrounding the case.